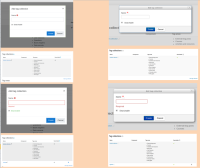 Go to "Site administration / Appearance / Manage tags"
Click on "Add tag collection"
Confirm that the modal closes. Click again on "Add tag collection"
Click on "Create" without entering anything in the "Name" field. Confirm that you get a validation message that the field is required. Enter something in the "Name" field. Confirm that you can successfully create a tag collection. Continuing from the previous section, click on the tag collection that you created. Click again on "Add standard tags"
Click on "Continue" without entering anything in the "Enter comma-separated list of new tags" field. Enter a list of comma-separated list of new tags and click "Continue"
Confirm that the tags are created and added to the list. Continuing from the previous section, tick at least 2 of the tags that you created. Confirm that the first option in the list of the tags to be combined is ticked. Click again on "Combine selected"
Tick on the second option and click "Continue"
Confirm that you see a message that the tags have been combined. Confirm that the option you selected is shown in the tags list and the others have been removed. Note: Test on Boost and Clean Tag collections Log in as an admin Go to " Site administration / Appearance / Manage tags " Click on " Add tag collection " Confirm that " Add tag collection " modal comes up Confirm that the form's layout inside the " Add tag collection " modal looks okay MASTER ONLY START Click on " Cancel " Confirm that the modal closes. Click again on " Add tag collection " Click on " Create " without entering anything in the " Name " field. Confirm that you get a validation message that the field is required. MASTER ONLY END Enter something in the " Name " field. Confirm that you can successfully create a tag collection. Adding standard tags Continuing from the previous section, click on the tag collection that you created. 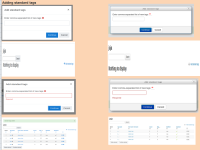 Click " Add standard tags " Confirm that " Add standard tags " modal comes up Confirm that the form's layout inside the " Add standard tags " modal looks okay MASTER ONLY START Click on " Cancel " Confirm that the modal closes. Click again on " Add standard tags " Click on " Continue " without entering anything in the " Enter comma-separated list of new tags " field. Confirm that you get a validation message that the field is required. MASTER ONLY END Enter a list of comma-separated list of new tags and click " Continue " Confirm that the tags are created and added to the list. Combining tags Continuing from the previous section, tick at least 2 of the tags that you created. 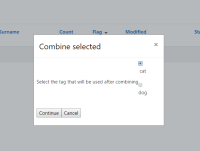 Click on " Combine selected " Confirm that " Combine selected " modal comes up Confirm that the form's layout inside the " Combine selected " modal looks okay Confirm that the first option in the list of the tags to be combined is ticked. Click on " Cancel " Confirm that the modal closes. Click again on " Combine selected " Tick on the second option and click " Continue " Confirm that you see a message that the tags have been combined. Confirm that the option you selected is shown in the tags list and the others have been removed. A lot of these are forms inside the modal that don't follow the guidelines in the Bootstrap docs.